Stock status is current as of 4/26/2019 4:23 AMET. Extend your existing router's Wi-Fi Internet coverage with the NetGear Powerline PLP1200 Bridge. You no need to configure or install software, just plug the PowerLINE Adapter into your modem or router, then plug in the companion PowerLINE WiFi access point to an electrical outlet that's it. Also with the help of NetGear Powerline PLP1200, you can create a seamless wired connection in any room in your home, even if it's far away from your router. The NETGEAR Powerline 1200 + Extra Outlet extends your wired network at 1.2Gbps speeds with Homeplug AV2 MIMO. Due to this the Powerline 1200 + is perfect for connecting smart TVs, streaming players, and game consoles wirelessly. 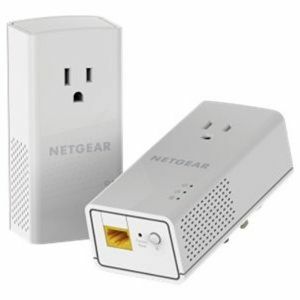 Buy NetGear Powerline PLP1200 Bridge today!